Thanks to their grandparents Cakey and Boo were the very lucky recipients of a doll's house at Christmas. This house also came with a stash of lovely pink and white furniture. I decided that I wanted to make some accessories to go with it. The first thing I tackled was some plates of food. When the kids were asleep I cut out two pieces of white card to act as plates. I then moulded my fake food from little pieces of tissue paper and glued them into place with a generous amount of pva glue. To be brutally honest, the spinach was supposed to be peas but as I stuck each 'pea' down the tissue paper unfolded itself so it ended up looking like a pile of wilted spinach. 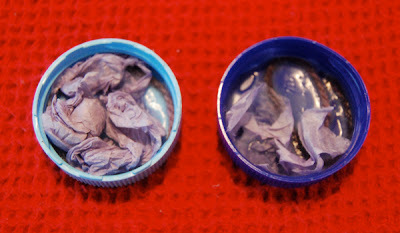 To make the spaghetti I use little pieces of wool and added meatballs made from tissue paper on top. Once the glue was dry, I painted my little dinners to resemble actual food – spaghetti and meatballs with a tomato sauce; and sausages with a carrot and spinach. When Cakey discovered them in the doll's house she was very excited. She wanted to make some too. 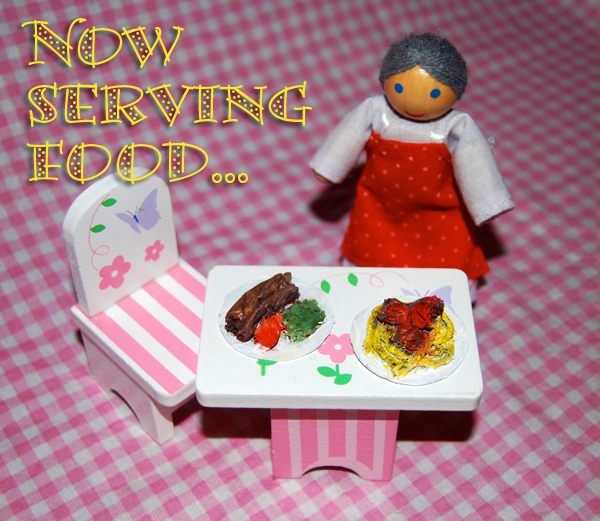 I set her up with some wool, tissue paper and a couple of milk bottle lids and she made some little dinners. The next step was to create some wall hangings for the doll's house. 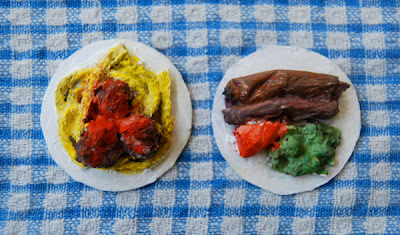 I cut out a couple of small pieces of heavy construction paper – and Cakey painted her contemporary artworks on them. 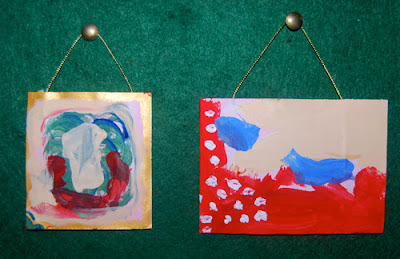 Once dry, I mounted them onto cardboard and glued on little gold cords ready for hanging. Last but not least, Chris got out the sewing machine and made a little bed covering out of an old tea towel. Now the dolls can stay nice and warm. I have a few more plans such as towels for the bathroom, some floor mats and bean bags. 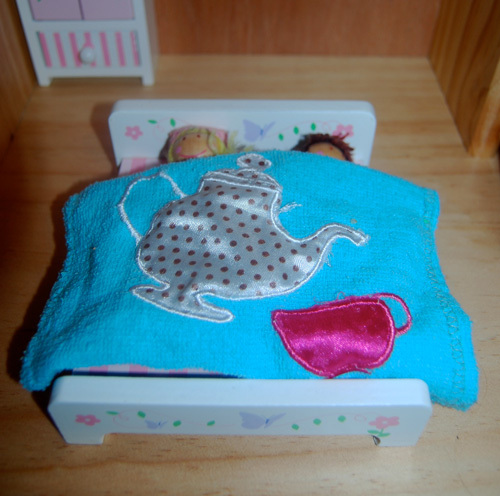 If you have a doll's house that needs accessorizing or want to make your own doll's house have a look at Red Ted Art's blog – there is a great post about how to make a bathroom and a very cosy bed. I also love the retro decoration of the doll's house by silly eagle books. We love making things for our dolls house! No need to get onto the food! I am SO looking forward to making dollhouse furniture and accessories for Azalea. If she doesn't like miniatures I'll just have to make a doll house for myself! So cute!! I look forward to seeing you at My Dream Canvas! Oh wow.. a doll house.. really!!?? 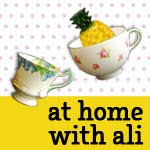 I'd love to make one for my girlies.. and even made the furniture and the accessories.. aawwww.. such a super cute idea..